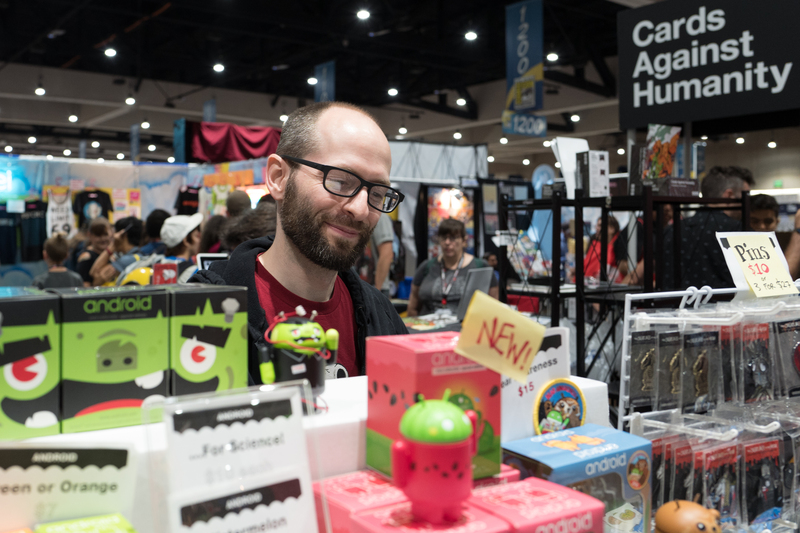 The greatest geekfest and pop-culture event on the planet wrapped up this afternoon in San Diego, as the original Comic-Con closed its doors on the Convention Center. Imitator shows are everywhere this Century, but none commands character and class like the original. The first, full, three-day event took place from Aug. 1-3, 1970, at the U.S. Grand Hotel, with about 300 attendees and sci-fi luminaries, including Ray Bradbury and A.E. van Vogt. This week, 140,000 people attended, but the number doesn’t include the tens of thousands descending on the Gaslamp Quarter and other areas of the city. 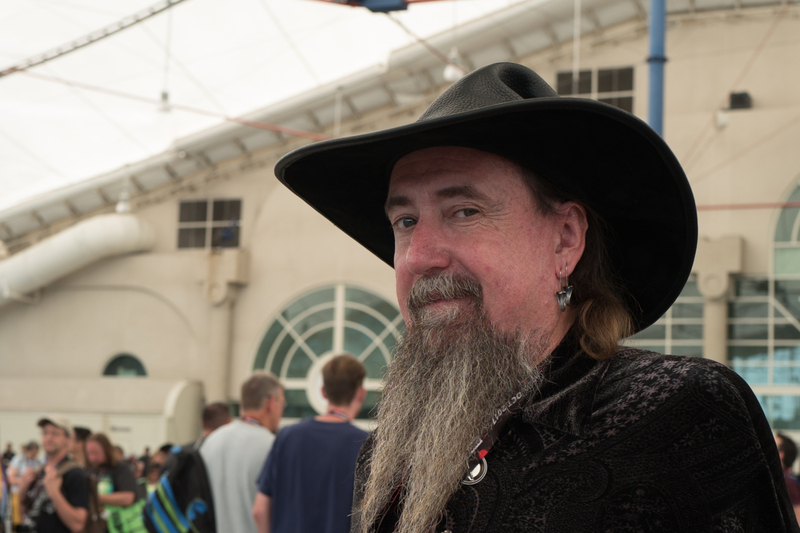 SDCC is too big to be contained by the formality of a single glass-and-steel structure or the fire marshal’s mandates. I had given up on participating until unexpected opportunity occurred yesterday morning to purchase a legitimate Day 4 badge with my name—not one assigned to someone else and sold for exorbitant price, despite firm policy against such scalping. I picked up the badge in the afternoon, spending several hours afterwards in the Quarter. Like yesterday, I captured moments using Leica Q, but far fewer than my typical day. Those that follow aren’t all, or necessarily the best, but they tell a story about shooting them. 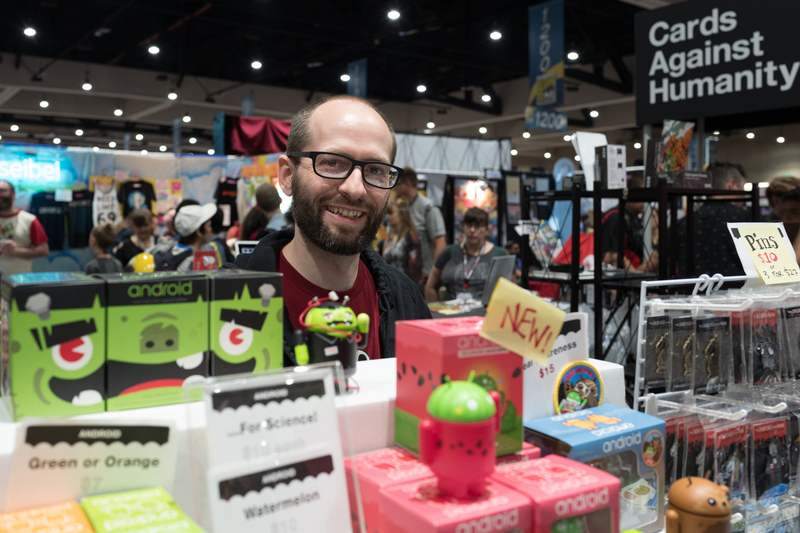 No Con would be complete without visiting artist Andrew Bell at the Dumbrella booth. He nodded recognition on my approach, saying: “I wondered if I’d see you”. I explained how he almost hadn’t and that my Android-logo T-Shirt was worn in his honor. Last month, he announced his engagement. I asked Andrew if the couple had set a date. Nope. They both live in New York, where everything is expensive. Stay tuned for details, I guess. Image vitals: f/4, ISO 800, 1/60 sec, 28mm. The first portrait is meant for Andrew and his fiancé; his handsome smile fills the Dumbrella booth. The second is for me, and perhaps you, because its character implies narrative—an artist looking towards his creations; that’s photographic artistry for me. Confession: I bought a watermelon Android Collectible, which is too cute for words. Pic vitals are same as the other. Some moments just happen outside your control. 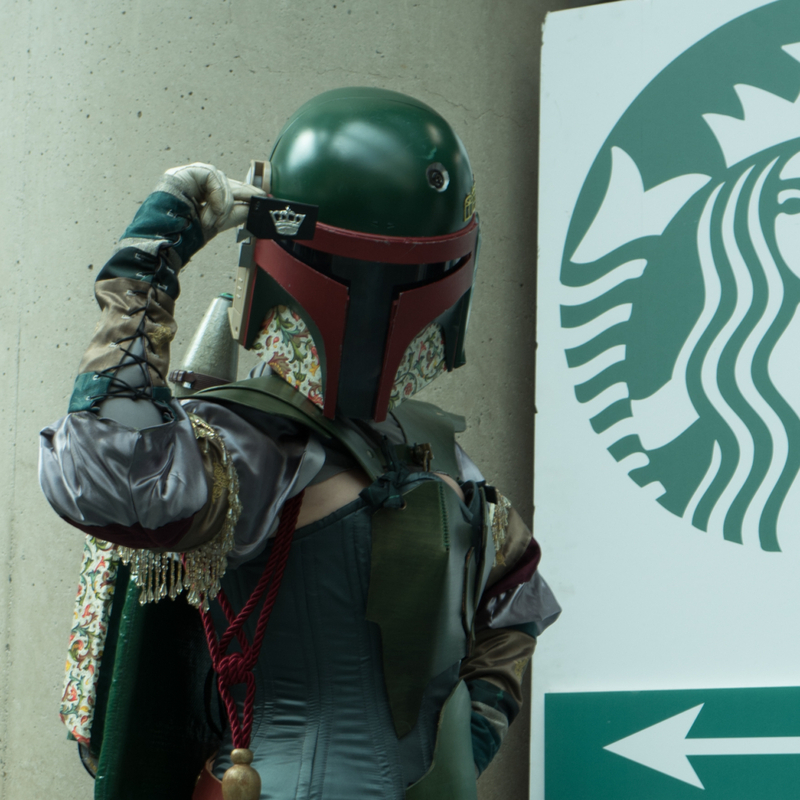 Who would have guessed this cosplayer would appropriately be standing next to the Starbucks sign with arrow pointing to her. This portrait is a crop of the Featured Image, which was first capture of the day. 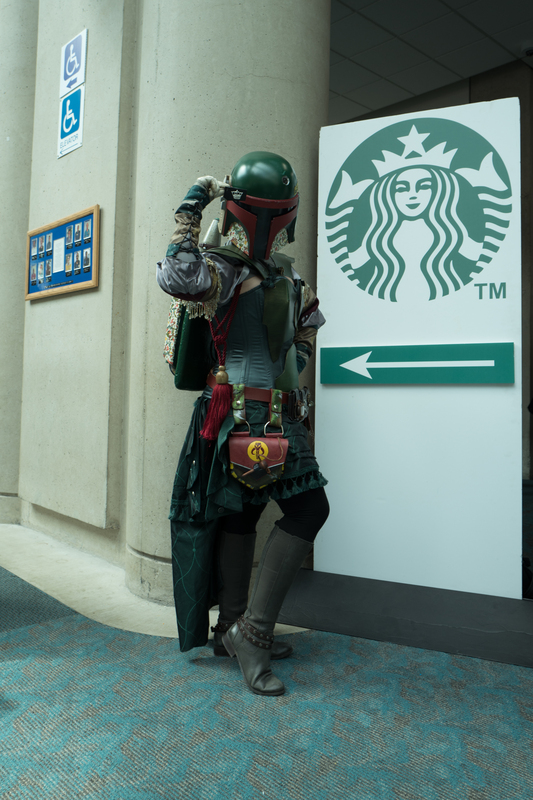 I shot the Starbucks bounty hunter, and Bell portraits, using autofocus—and they were last for the Con. I manually manipulated for the rest, chose aperture for all, and set shutter speed to 1/125 sec for some. 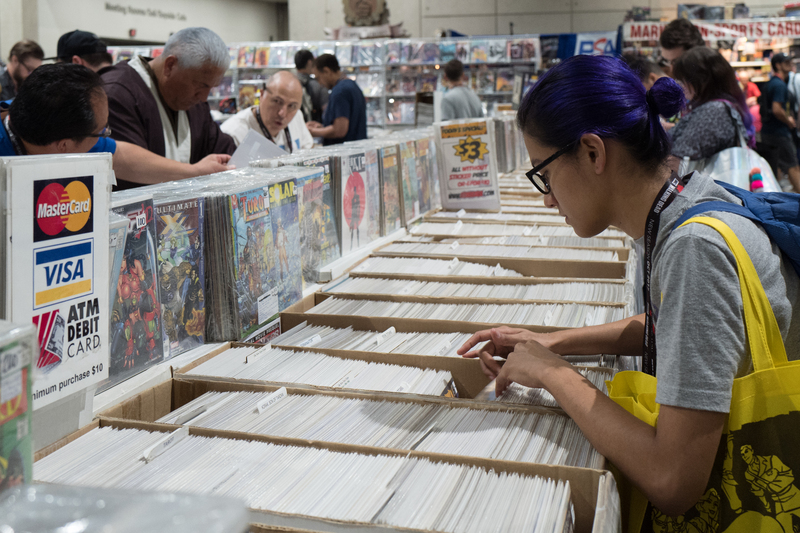 Comics are the Con’s core—its soul—despite their seeming decreasing presence. You won’t see as much space given to selling them as years past. But the stories and heroes behind them are everywhere, as they continue to dominate movies and television. 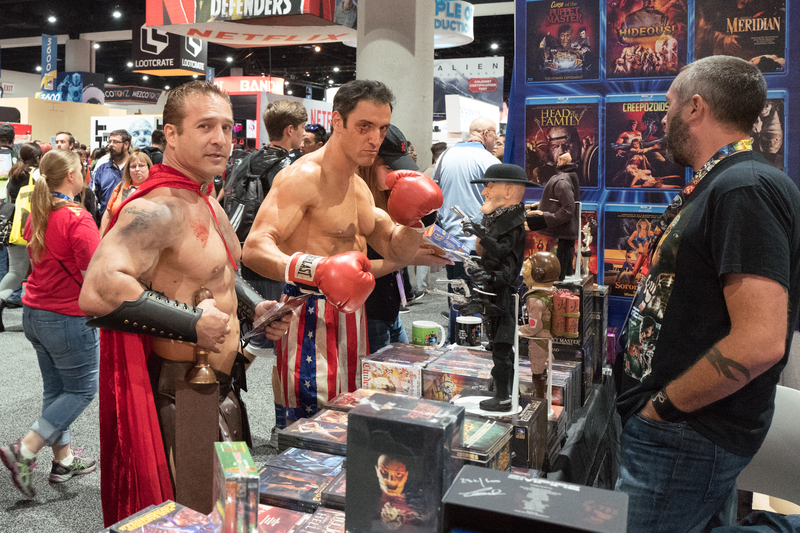 As I explained in the conclusion to my 2013 ebook Comic-Con Heroes: The Fans Who Make the Greatest Show on Earth: “Hollywood isn’t taking over [Comic-Con]. 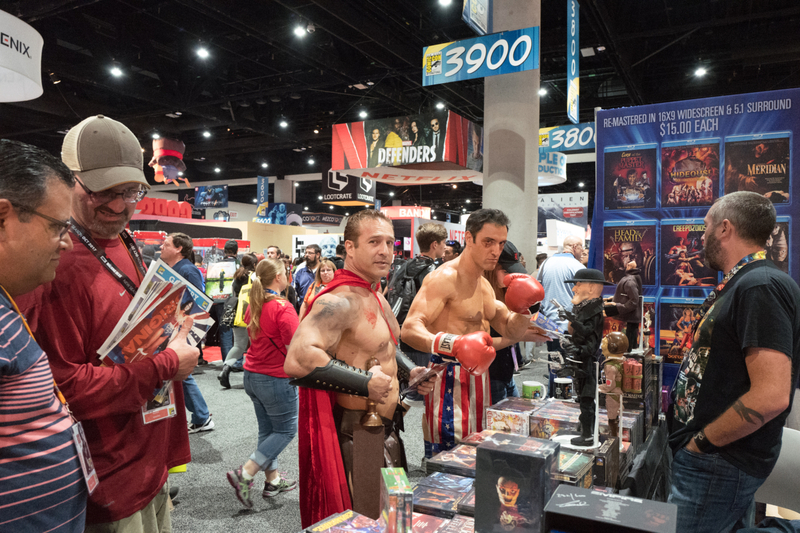 Dreamers and nerds, the convention’s lifeblood, have taken over Hollywood“. Consider this: Year to date, the top-five grossing movies are hero or heroine based, with four coming directly from comic books, according to Box Office Mojo. Image vitals: f/4, ISO 2000, 1/125 sec, 28mm. 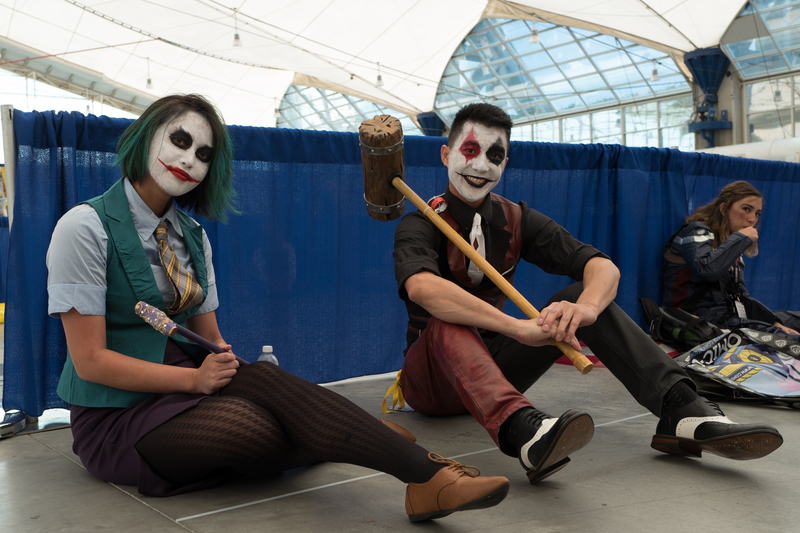 Fans attend the Con for many reasons, with autographs being one. 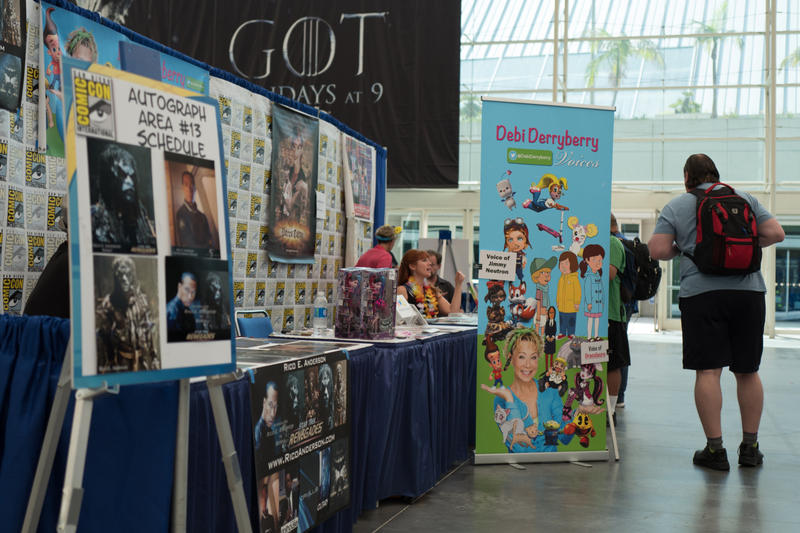 The Autograph Area, located in the Convention’s Pavilion, was different this year; fewer actors and more artists. The change is strangely fitting. Every year, I joke about the has-beens hanging out there, with the brunt of poking directed at Richard Hatch. He died in February 2017. Image vitals: f/2, ISO 100, 1/1000 sec, 28mm. I often shoot more photos in the Pavilion than any other locale, because light is best. This gentleman has the most interesting pants. I composed a single, full-body shot from the back before asking him to pose. But during post-processing at home, I found that a rather hefty lady had bombed the composition, so the pic isn’t featured as planned. Image vitals: f/4, ISO 100, 1/200 sec, 28mm. 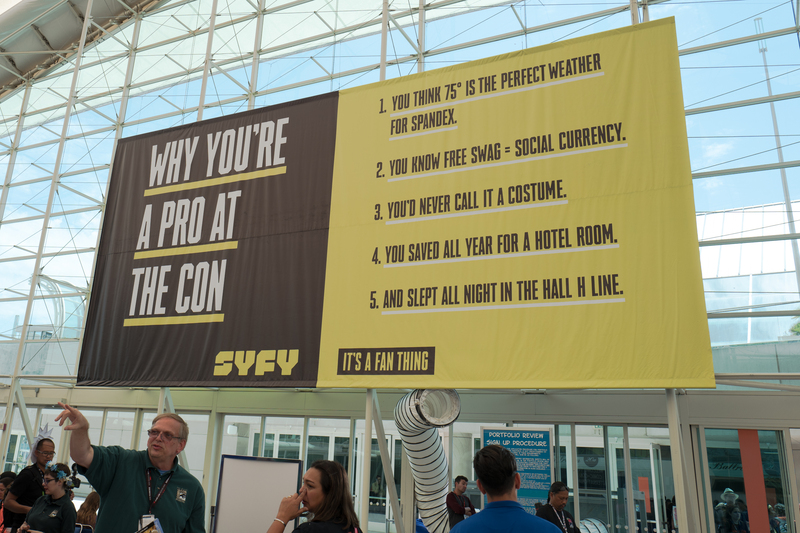 I passed this banner hanging in the Pavilion five or six times before deciding to capture it. In the first post-processing pass, I cropped out people below but decided they add a little ambiance. If you’re clueless about “the Hall H line”, read my July 2015 post and this LA Times history, dated today. Image vitals: f/6.3, ISO 100, 1/200 sec, 28mm. I shot two different portraits of this couple, at distinct locations in the Pavilion. Here, they had just plunked down for some chow. I lay down on the floor to get this shot, which is cropped for better composition. Vitals: f/5.6, ISO 100, 1/60 sec, 28mm. 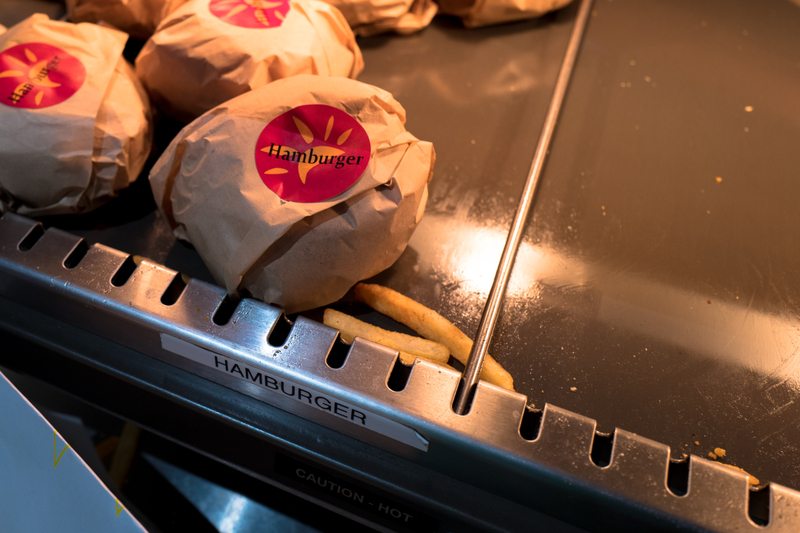 Speaking of food, the hamburgers are dry and the buns crusty—all for the unpleasing price of (cough, cough) $9.25! Frak me! No wonder that after eating this, I shot no more photos. Vitals: f/4, ISO 400, 1/60 sec, 28mm. Obviously then, the rest were moments made before my tastebud-tortured lunch. 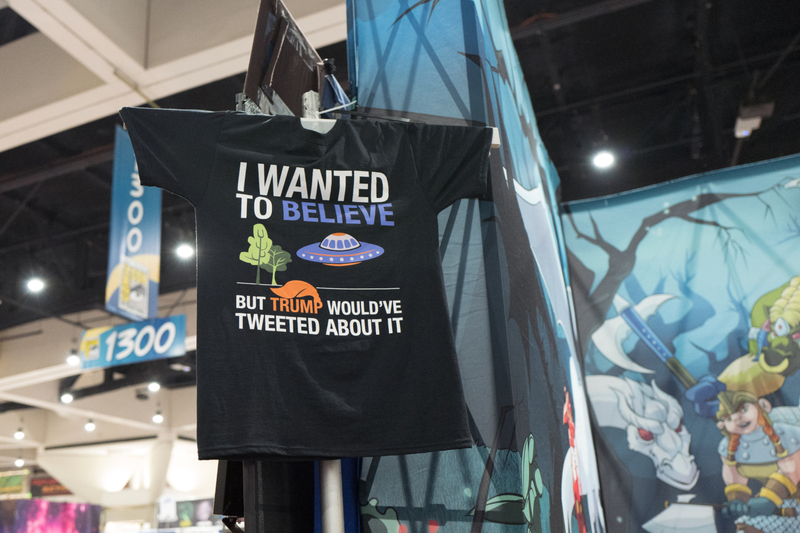 Like this T-Shirt, which I considered buying during three different passes by the booth, but didn’t. Vitals: f/2.8, ISO 4000, 1/125 sec, 28mm. With so much movement around the show floor, aperture 5.6, shutter speed 1/125 sec, and Leica Q’s stabilization feature prevented motion blur. But the settings also pushed up ISO—to 10,000—for this portrait, increasing noise with it. Do you prefer the original, perchance, which bookends the muscled-heroes with—ah—husky men? I prefer the crop, but the other could be considered more interesting. 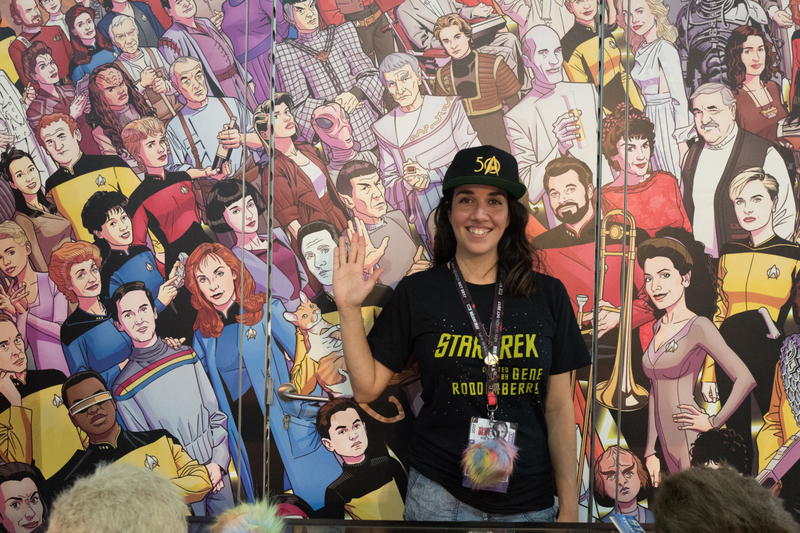 Meanwhile, at the Star Trek booth, this young woman proved to be friendliest, happiest vendor of the day. Where’s the weariness so pervasive as the Con’s end approaches? She lives in a different universe, and I want to go there, too. Image vitals: f/4, ISO 6400, 1/125 sec, 28mm. What could be farther from the future than harbingers of the past? Like these cosplayers who should be extras in Hulu series “The Handmaid’s Tale“. Vitals for the tight crop(s): f/5.6, ISO 100, 1/100 sec, 28mm. Oh, Hell, here’s another, shot seconds later and closer-cropped because of a photo bomber to the right. 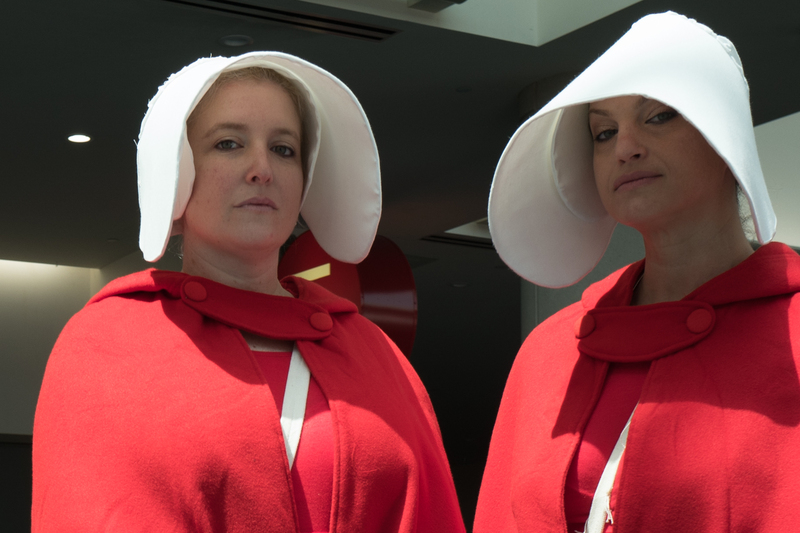 These women’s expressions tell the Handmaid’s story. 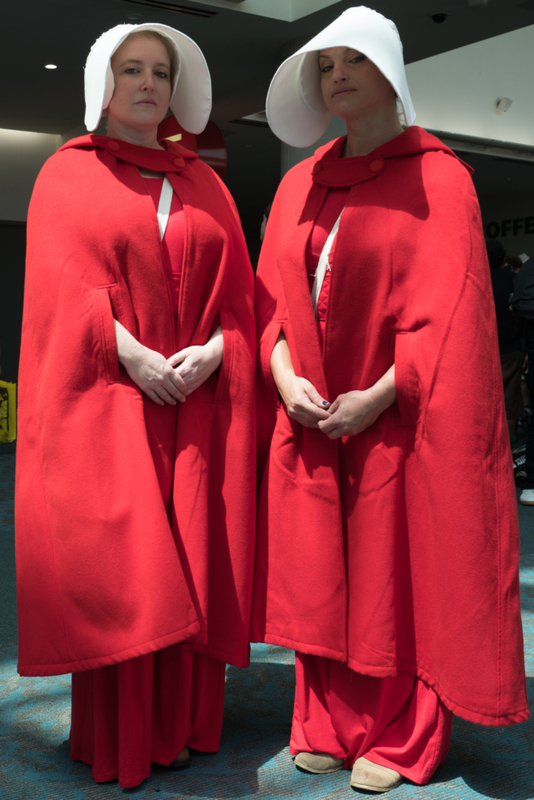 Blessed be the fruit.